Bank Run - What Does It Mean? What is a "bank run"? 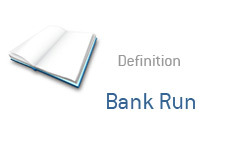 What is the definition of a "bank run"? Bank runs occur when depositors (customers) at a bank start to feel as though the bank may fail, which leads people to withdraw most or all of their money. If many people withdraw (or try to withdraw) all of their money in a short period of time, banks may have trouble coming up with all of the necessary cash. Banks are only required to have a small percentage of their total deposits available in cash, meaning that banks can run into trouble quickly if a number of depositors all decide to pull out their funds at the same time. The "problem bank list" is designed to identify banks that are most susceptible to a "bank run". Regulators will identity the weakest banks (through periodic audits) and tell them how to fix their problems. The banks on the "problem bank list" are kept a secret because regulators fear that people will pull their money if they find out that their bank is in a weakened state. In short - bank runs occur when many people decide to pull money out of a bank at the same time.